Week Two of 2011 has not been the routine-ruled week that I was hoping for after Week One (a.k.a The Week of Vomit in The Face). So I have dropped my expectation of a schedule for next week. This is especially wise since our local school calendar has incorporated three days off next week, one for the holiday and two teacher work days. This is good for the teachers but bad for the kids and parents since we had an interrupted school week with a snow day this week. Stop & start education doesn't work well with my kids. Or me. My kids are great when they have a consistent routine. But since we basically have not had one since mid-December, they are rebelling against the school/homework/whatever parents want routine. Which is why I am going to the mattresses. I am breaking out my old copy of Love and Logic. This is for me a tried and true technique to get my kids back on track with whatever - homework, sassy mouths, basic listening, cleaning their rooms, eating - while keeping my sanity. My favorite technique suggested by L&L is to say "I love you too much to argue" in response to EVERYTHING. It keeps me from engaging in arguments with them (or rationalizing with the irrational as I like to think of it.) Try it yourself. It works on ANYBODY. That little phrase takes the ummph right out of the other person's argument. They have nowhere to go. And you come away the nice one...because you threw love into the mix. On another note, this week I used the phrase "that's a young person's sport". I was referring to skiing and snowboarding. I am a Southern girl and skiing was never something I did frequently. Maybe twice in my life I have skied. The risk of injury for me now is too great. And even the risk of just being really sore is too great for me now. And speaking of being sore, I have a pulled muscle. As a runner, that can happen from time to time. But this is not a running injury. In fact, I am not sure how I pulled this muscle. It's in an odd place for muscle pulling...it's in my face. Yes, I have somehow pulled a very tiny muscle that sits right along the lower edge of the cheek bone. 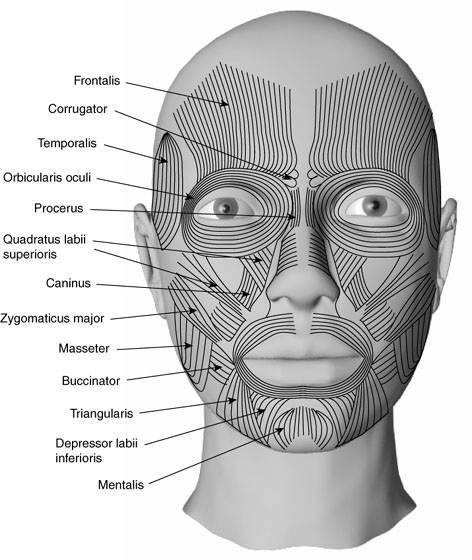 I think it's the zygomaticus major that I've pulled. It hurts. My orthodontist suspects that I inadvertently shifted my bite while clenching my jaw. Could that be a response to our upset routine? And now do you see why I say things like "young person's sports?" Pulled muscles should come from real exertion. But I think something else happened. Like maybe when I was holding the long note in Sister Christian ("motoriiiiiiiiiiiiiiiiiiin!") at a red light earlier this week. Maybe I got a bit carried away. Hey,there is no law against reliving the '80's while driving. Yet. And that definitely is not a young person's sport. Oh, I should've linked up, 'cause my post today is definitely fragmented! So funny that you possibly pulled a face muscle singing "Sister Christian"! Who can listen to that song and not sing along? My sister in law calls them 'sleep injuries'...you wake up and you have some odd muscle ache or pain for which there is no explanation. Apparently when you're over 40 just sleeping can be hazardous to your health. I have "Teaching with Love and Logic"...think I need to reread it! I often wonder who actually makes the school calendar cuz it sure isn't anyone thinking of the best interest of kids. LA public school has a whopping three week Christmas vacation in the middle of the semester. It makes no sense. Ugh. Hope that sore muscle is better soon!